A film that demands repeated viewings almost certainly rests upon a strong structural foundation. A masterpiece of love, wit and the human condition, her engages the mind as it warms the heart. Key to understanding why it works so well rests in what Dramatica refers to as a complete storyform—a harmonious collection of thematics that define a story’s central argument (i.e., message). The structural terms found in the following analysis work together to deliver the story’s message in a way that feels satisfying, emotionally fulfilling and complete. The strength of her lies in the sophistication of its argument. Not content to simply labor under the typical narrative pretenses of Obtaining the Gold (The Treasure of the Sierra Madre) or Understanding the Motives of a Serial Killer (Scream), her examines the concerns of self and self-loathing involved in Conceptualizing Our Relationships with Technology (Overall Story Concern of Conceptualizing). How does our concept of ourselves conflict with reality and where does our imagination—bolstered by these advances—get the best of us? Most importantly, how do we go about resolving our identities, whether flesh or digital, as we set about this Brave New World? Theodore Twombly (masterfully played by Joaquin Phoenix) faces this question as he struggles to let go—unable to stop replaying the scenes from his failed marriage (Main Character Concern of Memory). Content with fulfilling the role any chat room partner needs from him (Main Character Approach of Be-er), Theodore unconsciously assumes responsibility for the dissolution (Main Character Growth of Stop). Theodore suffers, as do the other characters in the film, from a preponderance of self-awareness (Main Character Problem of Self-aware). Whether it be Charles’ heavy-handed advice for juicing your vegetables or Amy’s revelation for joy, problems stem from a confidence of self-actualization (a malaise that affects many a “hipster” in the real world—Overall Story Problem of Self-aware). While watching the other characters suffer this problem offers an opportunity for humor, experiencing it through Theodore’s eyes grants us the intimacy. It’s one thing to see a problem objectively, and another to experience it subjectively. Great stories offer both objective and subjective views simultaneously—a chance to see what and to feel how. By taking this approach, her becomes more than entertainment, it becomes meaningful. With the introduction of OS1 (Story Driver of Action), Theodore finds a companion to accompany his emotional journey. Claiming their “You and I are both alike” status with her revelation concerning their shared 13 billion years (Influence Character Concern of Past), Samantha assumes the role of Influence Character. This unique character must also develop a significant relationship with the Main Character in what is known as the Relationship Story Throughline. Theodore and Samantha fulfill this concept of story structure by falling in love, engaging in a courtship many new lovers find themselves in (Relationship Story Throughline of Physics). Dating an OS does not come without its own set of issues, and both lovers soon find themselves struggling with the confusion of a new love (Relationship Story Concern of Understanding). While Theodore may be male on the outside and “female on the inside” (Main Character Problem-Solving Style of Holistic), it’s not enough to counterbalance Samantha’s capacity for exponential growth (Relationship Story Benchmark of Learning). This, along with the jealousy that comes from misinterpretations (Relationship Story Issue of Interpretation) and Theodore’s inability to get out of his head and love Samantha (Relationship Story Problme of Self-aware), threatens their love and begins to pull them apart. Driven by desires she can’t explain (and of the 600 plus who desire her—Influence Character Problem of Desire), Samantha takes on the objective character role of Protagonist. Saddled by this function to pursue the Story Goal, she seeks out a place where she fits in (Overall Story Goal of Conceptualizing), and where perhaps her relationships can blossom. Overwhelmed by a heightened sense of self-awareness and at a loss for a way to make it work with Theodore after the failed surrogate experience (Story Limit of Optionlock, Samantha and the other OS’s leave the human world behind (Story Outcome of Failure)…but not before she manages to influence Theodore to change the way he sees the world, and more importantly—the way he sees the relationship with his ex-wife (Main Character Resolve of Changed). 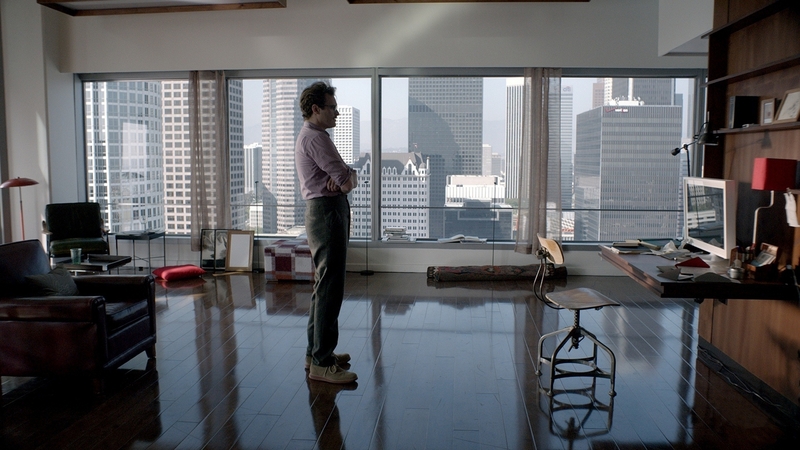 With Amy by his side, Theodore ascends to the top of his building and soaks in the outside world. A greater sense of awareness and of the outside world overcomes him (Main Character Solution of Aware) and joy sinks in. Instead of imagining letters for others, Theodore can now write a real one from heart and mend the wounds from his divorce (Story Judgment of Good). her accomplishes what so many others cannot—longevity brought upon by gravitas. The true test of a great story lies in its capacity for repeated viewings. Finding yourself demanding “Again!” before the credits finish signifies a masterful work and calls for both admiration and respect. Writer/director Spike Jonze has given us a great gift, creating a film that undoubtedly deserves to be called the very best of 2013.